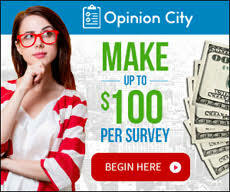 Opinion City is a company based in US. It is one of oldest survey companies out there. To be paid, all that you will be required to do is review some products as well as take online surveys. Seems easy, right? We have made several research as usual before we publish any post on this blog and we realized that Opinion City is legit. With videos, you can earn up to $0.25 for watching vides online. Most of the videos are short. You will probably enjoy watching the videos than taking the conventional surveys. There are cash contests in opinion city almost every week. After joining the site, you should be on the look out for these contests. You can earn up to $15 from these contests. There is no much stress in registering to opinion city survey program , all you have to do is to follow the link below to register immediately.